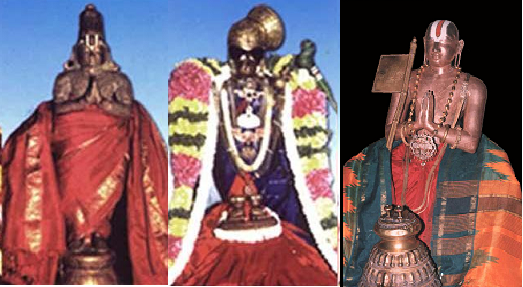 I constantly worship the lotus feet of bhUthathAzhwAr, poigai AzhwAr, pEyAzhwAr, periyAzhwAr, ANdAL, thirumazisai AzhwAr, kulasEkara AzhwAr, thiruppANAzhwAr, thoNdaradippodi AzhwAr, thirumangai AzhwAr, srI rAmAnujar, madhurakavi AzhwAr and nammAzhwAr. This divine slOkam was rendered by srI parAsara bhattar when he was in thirukkOttiyUr with nanjIyar. He left srIrangam due to the disturbances given by the local king, vIra sundhara brahma rAyan. At that time, out of the unbearable separation from srIranganAthan, bhattar complied this slOkam and the thanians of thiruppAvai to immerse himself in bhagavath/bhAgavatha anubhavam. 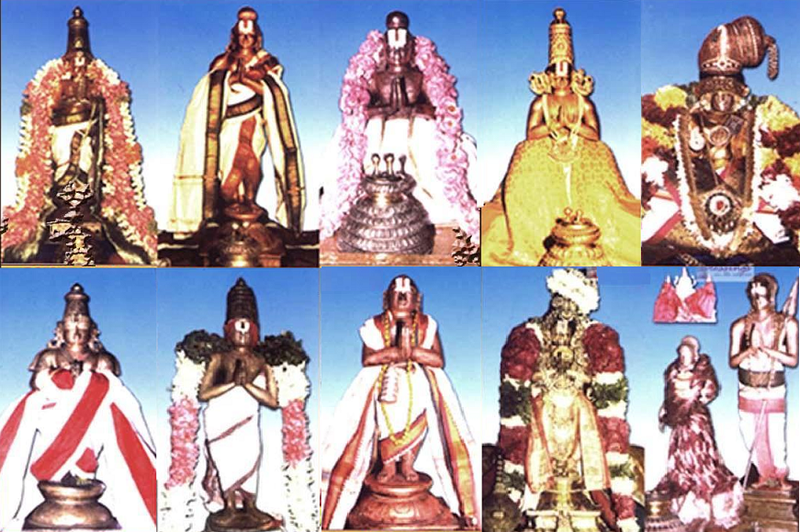 In this slOkam, in addition to identifying the 10 AzhwArs (poigaiyAr, bhUthAr, pEyar, thirumazhisai AzhwAr, nammAzhwAr, kulasEkara AzhwAr, periyAzhwAr, thoNdaradippodi AzhwAr, thiruppANAzhwAr and thirumangai AzhwAr), he also identifies ANdAL using the word “srI”, madhurakavi AzhwAr using the word “misra” (very learned/respected) and rAmAnujar using yathIndhrar. A section in the 6000 padi guru paramparA prabhAvam establishes the validity and glories of AzhwArs. To read them click http://ponnadi.blogspot.in/2013/02/dhivya-prabhandha-pramanya-samarthanam-1.html and http://ponnadi.blogspot.com/2013/02/dhivya-prabhandha-pramanya-samarthanam-2.html . An e-book is available with the full charithram and vaibhavam of AzhwArs and srI rAmAnujar and can be viewed/downloaded from: https://docs.google.com/file/d/0ByVemcKfGLucWWdDZkhYMUVaUk0/edit. thanks for kindly pointing out. adiyen have corrected it now.